Earlier this month the biopic screenplay writer, Anthony McCarten, who was behind films such as “The Darkest Hour” and “The Theory of Everything” brought moviegoers the 2018 film of the rock’n roll band Queen. The film primarily takes a focus on Freddie Mercury, the band’s lead singer, and his controversial life. The movie nevertheless delivers on what can only be described as absolutely joyful and compelling as the story unfolds. The “Bohemian Rhapsody” film takes over 15 years of the band’s history and condenses it into 2-hours of screen-time, so what unfolds on screen are the high and low-points of their career from their start in a pub in England as “Smile” to becoming “Queen” before thousands at Live Aid. With all of that time and history to consider, the film’s remarkable paces and structures it in a digestible way; it isn’t aggravatingly drawn out or too quick to understand but instead balances itself out with its own unique formula that allows the audience members to be drawn in close and holds their attention all the way until the end. What’s so different about “Bohemian Rhapsody” compared to other biopics, even other films entirely, is that there is not a clear antagonist; when there isn’t one it’s often regarded as a weakness of the film. However, “Bohemian Rhapsody” does just that but, the right way. For the first half the audience can stay intrigued as the band is rising to the top, with critics, newscasters, even HIV/AIDS as a form of lesser antagonists, but soon Paul Prenter (former band manager) becomes a main one as he pushes Mercury into a darker side of himself; until, Mercury becomes the antagonist himself. Historically, Mercury was a complicated man and with the rock ‘n’ roll lifestyle to add he became his own worst-enemy and this itself drives the latter-half of the film. Cinematically, this was the best thing ‘Bohemian Rhapsody’ could have done to remain accurate, but also to portray a redemption-arc for the Queen singer. A redemption-arc that was overshadowed by the controversies that befell Mercury during his life for his sexuality and public drunkenness and other demons that the singer struggled with. Regarding these controversies, the film has been bashed for “sanitizing” these events, and in doing so failing to acknowledge that they wouldn’t have fit into the film time-wise or story-wise. More importantly, that’s not the story that “Bohemian Rhapsody” wanted to tell; Brian May and Roger Taylor, former bandmates of Mercury, each had major input on how the story would be told and they agreed that the best way to honor Mercury would be to tell the story ‘they’ wanted to tell and not the one that the press tried to spin. When a biopic about someone famous or historical comes around what many focus on is ‘the look’ of whoever the film is about, films can often be praised on it like Daniel Day Lewis’ look in “Lincoln” and Margot Robbie’s from “I, Tonya” however, Rami Malek, the actor playing Freddie Mercury, doesn’t bare too much of a resemblance but it’s how he portrays Mercury that deserves praise. Freddie Mercury always had a unique Tanzanian-British accent which Malek nails, when comparing interviews and recorded performances of Mercury they’re almost one-to-one. Just copying Mercury isn’t itself praiseworthy, but more importantly Malek has a near-completely accurate portrayal of his mannerisms and antiques from on and off-stage. Wearing costume and makeup. Malek walked out of the dressing-trailer, opening it to see the sister of Freddie Mercury: Kashmira Cooke, who applauded Malek. The two had a lengthy talk with Malek saying to reporters of Vanity Fair that it was, “a moment I’ll treasure for the rest of my life.” Later revealing that “she said she was emotional. I got to sit with her and her son, and I think they were very moved.” Furthermore, Brian May and Roger Taylor also gave the actor positive marks. The film has been criticized a little unfairly as the picture takes several cinematic liberties in the telling of the Queen story to create a clear narrative for the viewers to follow. In particular, reviewers are quick to criticize the film on changing how Mercury met up with the band, the complete history of the band’s series of breakups, and other smaller details. What many do not consider is that the film went through numerous rewrites, reshoots, and recasting up until the films release; it’s entirely possible that from 2012, when the film was first being drafted, there were intentions to tell the whole and complete story of Mercury and the band, but to condense that into a film which wasn’t too long, too boring or too complex would have been nearly impossible. The “Bohemian Rhapsody” that we are left with at the end of the day is a fantastic film, never perfect as few films are, but nevertheless something anyone could enjoy the film with it’s great heart and incredible performances. 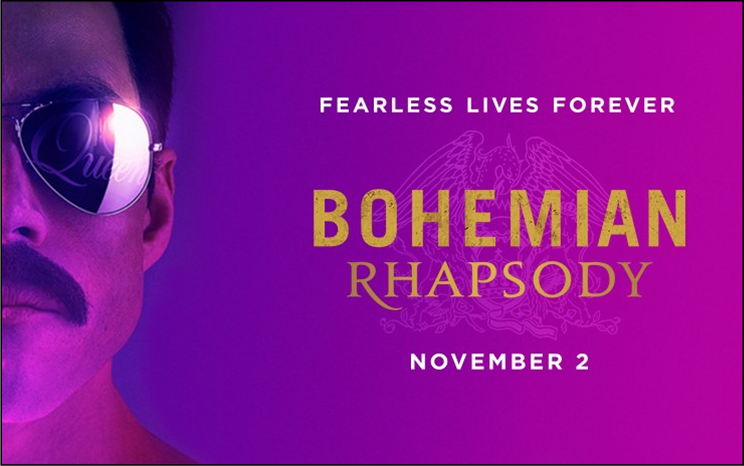 “Bohemian Rhapsody” was truly a joyous, incredible experience no one should miss. What type of Christmas Tree? What Should Students Be Reading? Top 10 Milford Events During 2017!